The Flamingo Villas Boutique Hotel. Nestled on the tidal edge of the Walvis Bay Lagoon, surrounded by scores of lesser and greater flamingos lies the undiscovered gemstone - Flamingo Villas Boutique Hotel. At first glance you will be transformed into a state of awe and surprise upon entering the Hotel it will become evident that your awe and surprise is very well founded. 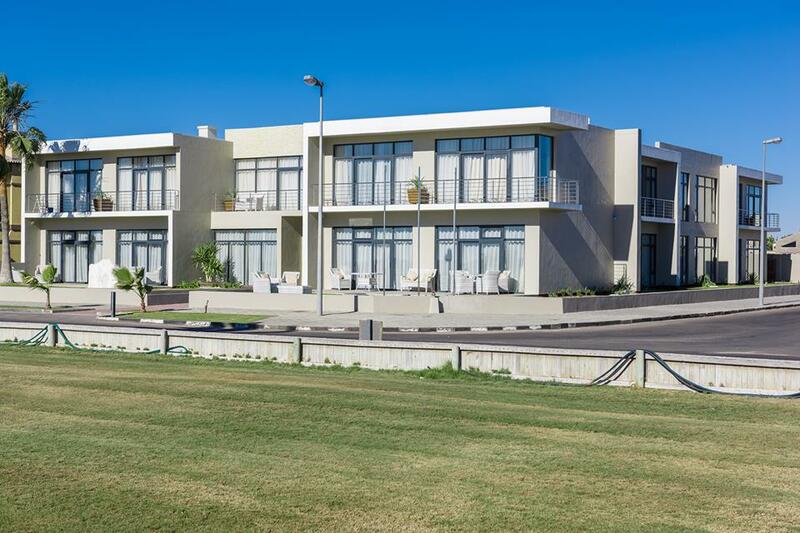 Our Boutique Hotel boasts with one of the most spectacular views of the lagoon and of course sunsets over the ocean with the peaceful Flamingos doing their “flamingo shuffle”. The boutique hotel comprises of 17 rooms in total of which 12 are standard all double/single rooms, 4 are deluxe rooms with the best ever view of the lagoon and 1 luxury room with a stunning 180 degree view of the Atlantic Ocean. All rooms are equipped with: air conditioning, TV, a laptop safe, coffee station, mini bar and free WiFi. Our restaurant offers the best fine dining cuisines in Namibia serving breakfast, lunch and dinner. We also have a full service Bar stocked with a range of wines and spirits from all over the world with the normal favorites on offer as well.